As superintendent, John Olcott knew the importance of preparing teachers for the common schools of Indiana. He also knew his school corporation would benefit from having the State Normal School nearby. Nearly 1,500 residents of Terre Haute agreed. When Olcott presented the petition to the Terre Haute City Council on May 1, 1866, the council members also agreed it was a wise investment. Two weeks later, Olcott and his committee presented the proposal to the Indiana State Normal School Board of Trustees. The board accepted the proposal - the only one it received - and declared Terre Haute as the site of the new school. "That decision was the beginning of a great partnership between Indiana State, the city of Terre Haute and the local school system. It is a partnership that has grown throughout our 150-year history and one that stands stronger than ever today," said Dan Bradley, president of Indiana State University. "These are just a few of the many ways the city and the school corporation have collaborated with Indiana State to contribute to our success. We owe both entities a debt of gratitude. It is our hope that our appreciation is reflected in the many ways Indiana State University students, faculty and staff give back to the community," Bradley said. "The Vigo County School Corporation and Indiana State University has enjoyed a wonderful working relationship that has lasted for many, many years," said Danny Tanoos, superintendent of the Vigo County School Corp. "Our great school system turns to Indiana State University when looking to hire the best-of-the-best teachers to educate our students. We cherish our past relationship with ISU, we celebrate our current partnership and look forward to working together in the future for the betterment of every student who graces the doors of our schools." "Can you imagine Terre Haute without Indiana State University? It would be a much different, and probably much smaller, place. Indiana State is one of our largest employers, and the recent growth in enrollment has had a visible impact on local businesses. In addition, the university has been a great partner in the revitalization of downtown and the riverfront, and its commitment to community service has had a measurable impact on our community," Bennett said. "We are fortunate to be the home of this great university." 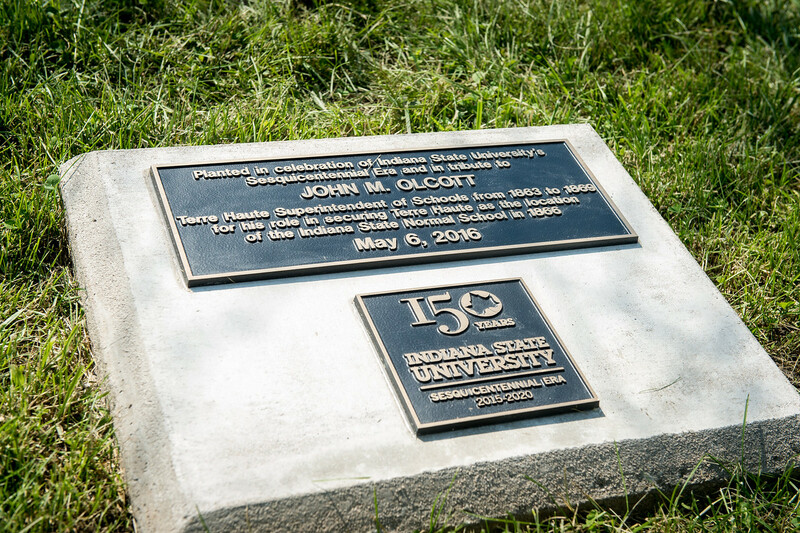 Following the board meeting, Indiana State and Vigo County School Corp. officials planted a tree with a commemorative plaque at Woodrow Wilson Junior High in John Olcott's memory. The Board of Trustees were set to host a dinner Friday night, where the resolutions will be formally presented to Superintendent Tanoos, School Board President Paul Lockhart, Mayor Duke Bennett and City Council President Todd Nation. Bradley said the University is also planning a community event for residents of Terre Haute later this year as part of the city's bicentennial celebration and in conjunction with the university's Sesquicentennial Era Celebration, which continues through early 2020. Photos: http://photos.indstate.edu/Events/Events-by-Year/2016/Tree-Planting/n-KdLQ9S/i-4PgFG7f/0/X2/i-4PgFG7f-X2.jpg -- From left, Dan Bradley, Indiana State president; Dave Campbell, ISU Board of Trustees chair; Ray Smith, Woodrow Wilson custodian; Susan Mardis, Woodrow Wilson principal; Paul Lockhart, Vigo County School Corporation Board President; and Danny Tanoos, Vigo County School Corporation Superintendent. Organizations had pivotal roles in securing Terre Haute as the location of the Indiana State Normal School. They were honored with a proclamation, tree planting event and dinner on Friday.